Such an event could not help but have its own protagonists, its own faces, who from their part managed to leave their mark. In the case of Bike Odyssey, these people participated in the race to live their own adventure and without knowing it they tied their names to the history of the event, won the interest of the audience and created their own stories. They came in to take and before they knew it they returned to their homes having contributed. Looking back at this year's Bike Odyssey, we dedicate these lines to the big protagonists of this amazing event. A big fight awaited Bike Odyssey's audience for the 8-days race, which created from the get go intense interest that not only remained throughout but also swelled up to the final stage of the race. 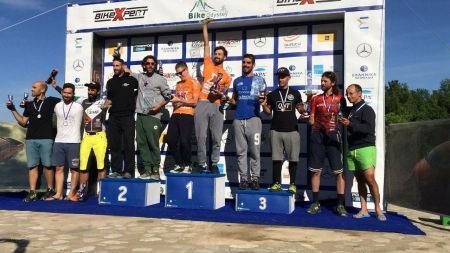 The two teams who stood out from the start and claimed first place in each stage were Papanikolaou Constantine and Kalogeropoulos Grigoris from Pedal Force One, and Mossoczy Zbigniew and Maciejowski Przemyslaw from BikeBoard. Those two teams, soon enough, created a rivalry between them, which, as the event went on, turned into a real derby!! The team from Poland managed to win five out of eight stages of the race, against their opponents’ three out of eight wins. However, Pedal Force One won first place, with a difference of less than four minutes in the overall ranking. A big battle also took place for the rest of the top six. Third place was occupied by Christou and Cole (Animal Rights), who, by delivering great performances, were almost always in the top three positions and occasionally threatened their frontrunners for the eight-days race. A great fight was also given between Daan De Backer and Andy Standaert (Ouzo? Azo! ), Jorgensen Lars and Larsen Bjarne (Pingel Mtb Race & Fun DK) and Toulouhas and Sotiriou (Best Men). These three teams gave their best in each race and after eight stages with repeated swifts and turns they occupied the 4th , 5th and 6th place respectively, having a difference of only a few minutes between them. Very interesting was the northern three-days race!! Evaggeliou and Kouprizas of team Night Riders won the position of the champions of the race along with the orange jersey. By delivering three amazing performances as they got three out of three wins and the first place in the overall ranking. Just behind them a little bit of chaos was taking place for the occupation of the next three positions, with ProBike Shop of TZafos and Zylis, Papasavvas and Chrysapellis of team Dynamic and Petridis and Drougias of Protect Aoos animalrights taking 2nd 3rd and 4th place respectively . With those three teams being absolutely stunning and constant swifts and turns taking place between them at each stage, the interest remained undiminished until the last mile before the finish line. A great race also took place in the last stages of the event for the southern 3-days race. The first place was monopolized by Papasavvas and Matsoukas (Sinetairoi) with the start of the 1st Stage, but the way they managed to do so was impressive in the least. By succeeding three wins out of three stages by a big difference from their hunters, especially in the first two stages of the race, they took the orange jerseys with a little less than one and a half hour difference from second place!! A major battle also took place for the rest of the top six, with the teams' ranking clearing up around the third stage, after two strong battles over the previous two days. 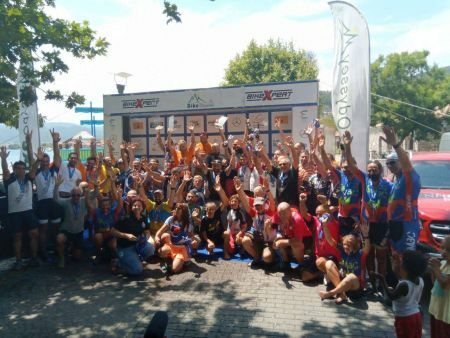 Eventually 2nd place was occupied by Rizos and Tabaropoulos of team West Bikers, followed by Mauden Hill Cycling by Perdkaris and Tsoharas, Stathis and Koutsothanas of Red Arrows Team, MegasYeeros.gr of Douvikas and Gouvas and Neromana- Kopana of Koukoulieros and Petropoulos.